I'm getting into doing transfers of Lp's to cd. I have come across some long forgotten records in my collection. First and old favorite, Hooray for Bix! Marty Grosz and His Honoris Causa Jazz Band (Riverside 1109 Stereo) featuring Carl Halen -What ever happened to him? Second, Billy Plays Bix --Billy Butterfield Jazz Band (Epic BA 17026 Stereo)-- nice evocative arrangements. These first two date in late fifteis and early sixties. Third, A Portrait of Bix-- Bob Haggart featuring Tom Pletcher(Jazzology 149 stereo) and finally, Echoes of Bix -Rosy McHargue and the Jazzin Babies. Great almost forgotten records! I'm enjoying them again. I only have the below tribute by Bunny Berigan and the indeed wonderful LP Billy Plays Bix, of which I will post some of the most significant tracks in a few days. And so: Stay tuned and enjoy! Not only the initials are the same, also the insane drinking habits of both men, Leon Bismark (he didn't like that reference at all!) 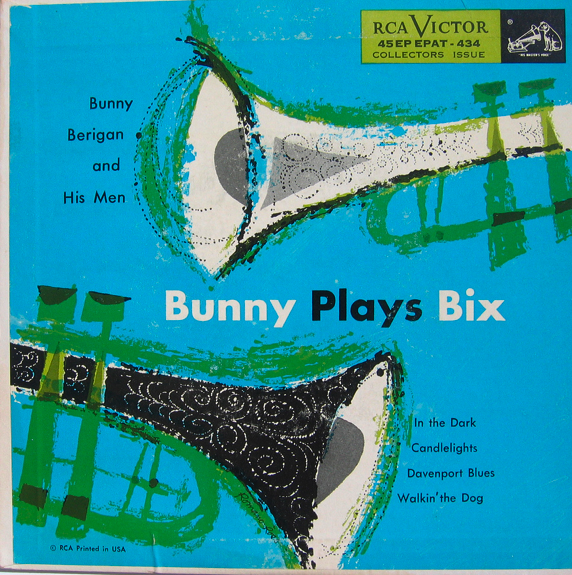 'Bix' Beiderbecke and Rowland Bernard 'Bunny' Berigan. Davenport Blues, here with Bix & His Rhythm Jugglers (1925) and the beautiful In A Mist with Bix at the piano (1927). ...and the walkin' wuff-wuff, not related to Bix, Walkin' The Dog.